A couple of years ago I wrote a post about productivity apps (project management, collaboration etc.) that I have used as I was getting asked about them a lot by our clients. I was re-reading it earlier this week and decided it was time for an update, because there are some new kids on the block and some changes that should probably be mentioned. So this is the 2019 update of this original post for your reading pleasure! In the past ten years, I have been exposed to some fantastic examples of team collaboration and project management. On the flip-side, I’ve also seen even more examples of it done wrong – and the negative impact it can have on both team and business! There are so many tools out there that are designed to help boost productivity, from super basic “to-do” list software to integrated, customised software developed specifically for your business. Most small to medium businesses get the most benefit out of something in between – it needs to be comprehensive enough to fit your requirements, but not so complex that your team can’t figure out how to use it. Cost is another big factor, as most of us just aren’t ready to fork out too much money for something that doesn’t provide a tangible value. Especially when there are LOTS of free options around! Anyhow, I’ve been asked several times recently about my preferred collaboration solutions, so I thought I’d throw together a quick run down on some of the top project management tools on the market for your viewing pleasure. They don’t all do the same thing. In my original post, I compared 5 of the most popular tools out there, but realistically they don’t all try to do the same thing. A good example of this is Slack vs. Producteev – Slack is a communication tool, whereas Producteev is a task/project management tool. In hindsight, I’m going to split this ‘Update’ into 2 sections – Communication & Project Management. Slack is great for teams that are spread out, work flexible hours, or want to promote lots of discussion and communication. It also has a very popular mobile app, which can make a big difference to how much your employees actually use it. If Microsoft integration isn’t important to you, I would rate it as one of the best communication tools for teams. It’s a great way to move away from constantly emailing back and forth with your team, and inevitably forgetting to CC someone in who then gets left out of the loop and the ability to separate different topics into channels is super useful. 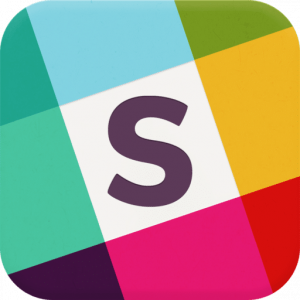 Check out my review of Slack which I updated yesterday based on my experience having used it extensively over the past year. In my original post, I spoke about Yammer – Microsoft’s ‘enterprise social network.’ In the last couple of years I’ve seen the usage of Yammer decline even more than before, but Microsoft do have a new tool on the block that is competing directly with Slack (and has essentially replaced ‘Skype for Business.’ The new product is called ‘Microsoft Teams‘ and they offer a free plan as well as paid versions that come included with a standard Office 365 for Business license. From 2016 to 2018 the market share of Teams jumped from 3% to 21%, making it now more popular than Slack. Integration with other Microsoft apps (such as SharePoint, Word and Excel) makes it an attractive choice for companies that deal with lots of documents and are invested in the Microsoft suite. While I love Slack for team communication, it requires integration with a third party app to do voice or video calls. The two most popular solutions for this are Zoom and Skype. While I haven’t used it personally, Microsoft Teams promotes calling and web conferencing from within the app and it has essentially replaced Skype for Business. Zoom is a great alternative if you don’t have Office 365 – their free plan allows you to host up to 100 participants and hold unlimited 1-2-1 meetings, including web conferencing. The free plan does limit you to 40 minutes group meetings of 3 or more, after which it will boot you off and you’ll need to restart the meeting. Zoom integrates with Slack, so you can conference call inside a channel or private message. 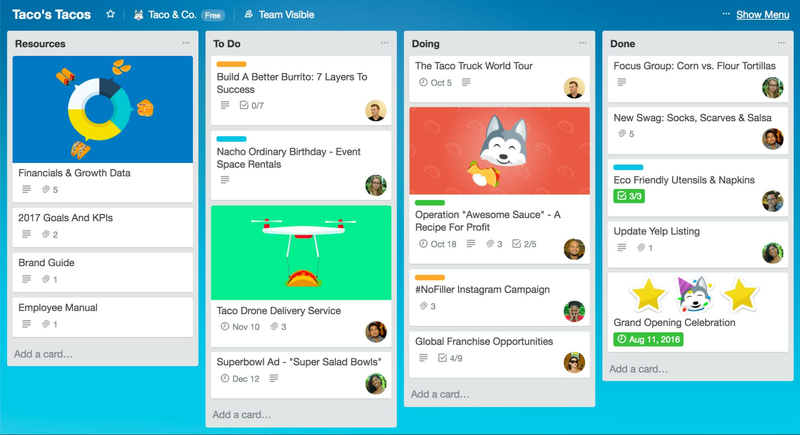 Trello uses three elements – boards, lists and cards – to manage your work. Typically you would have a board per project, lists for various workflow stages (e.g. To-Do, Doing, Done) and cards to represent individual tasks. Individuals who are a member of the workspace can be assigned to individual cards. I give Trello a hard time because in my experience it tends to be great at the start of a project and fall to pieces halfway through. If you have someone in charge of setting up and maintaining your boards (and a solid documented process on how you are using them) it’s a solid free tool. They do offer a paid option as well, which is more targeted at power users and enterprise level teams looking for additional functionality and automation. Asana is an extremely versatile and powerful productivity application that does pretty much everything except wash the dishes. It is also prohibitively expensive for small businesses if you need premium features – such as having more than 15 team members. If you are guaranteed to only ever have a small team of less than 15, the free version will get you by pretty well. Because of the number of features it can be a little daunting at first, so if individuals in your team aren’t particularly computer literate, perhaps consider a simpler alternative. We used Producteev after trialling a few other applications and at the time, I really liked the simple user interface and how intuitive it was to use. The ability to create separate networks is really useful, and so is the labels feature. If you are looking for a no-nonsense app to track tasks, this one is pretty great. The free plan has very few limitations and is great for small businesses, regardless of team size. Our reason for moving away from Producteev was because we found it was getting to basic for our needs and we needed something with a bit more flexibility. After a lot of searching and testing of other applications, we settled on a combination of Notion and Clickup which has served us pretty well for the past 12 months! I now use Clickup to manage my development team over at House Digital and we’ve found it to be a fantastic, reliable and constantly improving tool. The support team are fantastic, and the free plan has more than met the needs of our team. 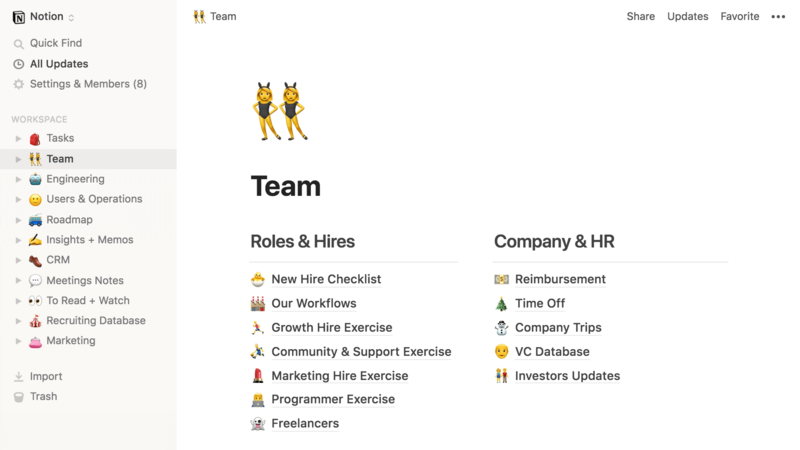 We tend to use it as a team in the “Agile Board View” but individual team members like the option to be able to view their own individual tasks in the simpler list view. For anyone using the Agile project management methodology it’s a really solid choice! The interface is very easy to use, and it’s a great way of dumping information somewhere where it can easily be shared and retrieved at a later date. Because most of the day-to-day operations at IT House are managed through our ticketing system, this is a great solution for the other stuff that comes with managing a business. There are a few things that I always take into consideration when deciding on whether or not an application is suited to a specific business. Here are the criteria I always try to keep in mind when I compare different products, that you might not have thought about. Many of the tools that are available offer fairly comprehensive free versions, and for some small businesses this is all you will ever need. One of the big things to watch out for is the number of team members permitted, as you don’t want to become reliant on a piece of software only to outgrow it in a year or two. One classic example of this is Asana, which is only free for teams of 15 members or less. If you only have 3 or 4 staff it might be a great choice, but if you’re already at 10 I’d consider some other options first that don’t hit you with a ridiculously high annual fee for a starter subscription. Another feature that is often withheld in free versions is the ability to create “secret” projects or tasks. There are often ways around this though, particularly for small teams. Simple to use, nice to look at. If you want people to use something every day, you’d better make it a pleasant experience. In a recent study it was found that a whopping 91% of employees agreed that simplifying enterprise apps would increase their efficiency and productivity. That seems like a pretty good reason to choose a tool that is easy to use! When you consider that the average number of applications used by employees has grown by a quarter over the past two years, we really need to focus on making sure software experiences are pain free and simple. While you might consider the work your team engages in pretty mundane, you need to consider how you feel about customers, competitors or ex-employees being able to view your tasks and projects. It seems like a pretty obvious thing, but I have seen examples of extremely large corporations unwittingly using open Trello boards for their project management. Face Palm. Most applications have privacy options you can set via the administrator account, but they may not be on by default. You also want to be able to remove people from your team if they leave your business. Two key things I look for in a piece of software, regardless of it’s nature, are whether it is easily integrated with other applications, and whether it will meet my needs in the future. Using Wunderlist might be fine for your family to create shopping lists and keep track of movies you want to watch, it’s probably not suitable as a project management platform. When there are just a handful of people in your business, one shared network might be enough – but what about in two years time when you decide you need a dedicated marketing team? Or you want to keep your office projects and field projects separate? In the future you may also want to integrate with external applications such as OneDrive, Skype or Office Online. Some of the tools, like the ever popular Slack, have hundreds of compatible apps that they can integrate with to improve your workflow, such as Manifestly (for recurring checklists), Google Calendar, Lucidchart and Screenhero. Finally, (because I’m still a nerdy data analyst at heart) I also took into account what options the various tools have for tracking, visualising and exporting your project data. For example one of the newer kids on the block Producteev make it very simple to export a list of your tasks both current and completed into a .CSV file. Perfect for when you need to throw together a fancy chart to impress your client or boss, showing how many tasks you’ve completed on that big project! Other tools, such as Slack or Yammer, are more focused on collaboration and communication so they can be a bit trickier to get useful analytics from. Has this helped you to make a decision about a productivity tool you’ve been considering? Is there a fantastic product you use that I’ve missed and needs to be on this list? Let me know! IT House is a leading provider of Perth IT Support services and Consulting. We help you best leverage your technology investments through specialist strategic advice, technology planning and out of the box IT Solutions. We service a range of Perth small to medium businesses operating in an array of different Western Australian industries including the resource sector, accounting, law, geographical information systems, retail and health.